Where has the summer gone? Kids across the country are heading back to school. Did you get to Pixar Fest this year? You’ve got until September 3 to get there. If you haven’t, I hope you’ve been celebrating along with us at home. This week we’re celebrating with FINDING DORY. Since it is back to school time too, I’m sharing some very easy and very cute cookies you can send in your child’s lunchbox. Life, Family, Joy has some yummy popsicles because even though it’s back to school time, it is still hot out there! These will keep you cool! It doesn’t seem like that long ago that we were celebrating FINDING DORY’S release! It’s been 2 years now! I’m sure you’ve seen this adorable movie, but if you haven’t, here’s a recap. In FINDING DORY, Dory is living happily in the reef with Marlin and Nemo. She suddenly remembers that she has a family out there who may be looking for her, so the trio takes off on a life-changing adventure across the ocean to California’s prestigious Marine Life Institute, a rehabilitation center and aquarium. 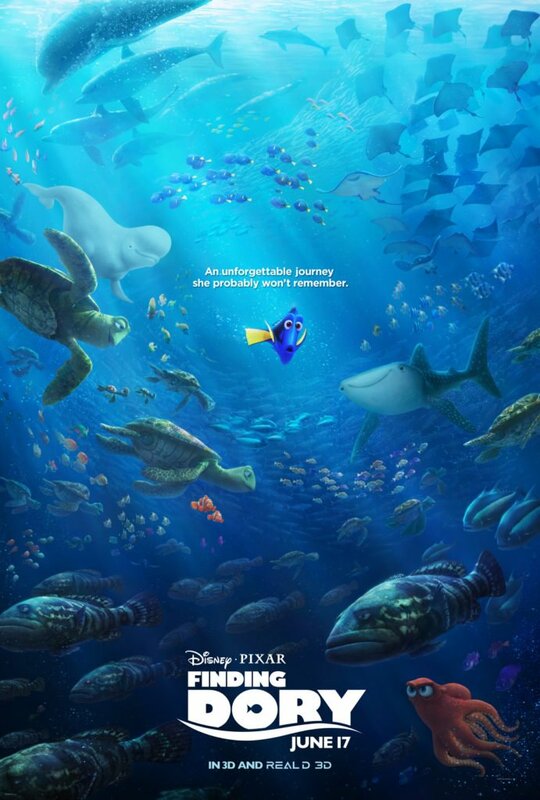 In an effort to find her mom and dad, Dory enlists the help of three of the MLI’s most intriguing residents: Hank, a cantankerous octopus who frequently gives employees the slip; Bailey, a beluga whale who is convinced his biological sonar skills are on the fritz; and Destiny, a nearsighted whale shark. 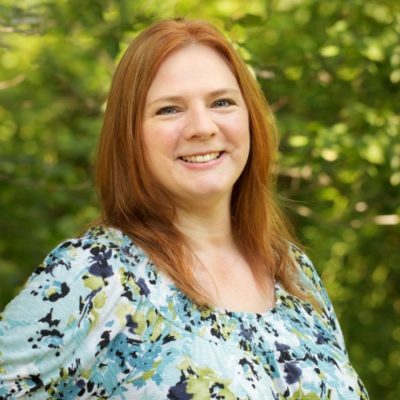 Deftly navigating the complex inner workings of the MLI, Dory and her friends discover the magic within their flaws, friendships and family. 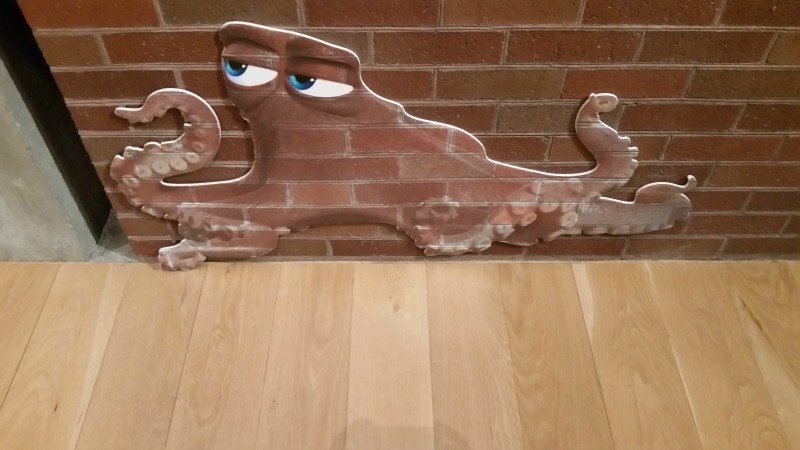 When I visited Pixar in April, I happened to spot Hank hiding out on a wall! 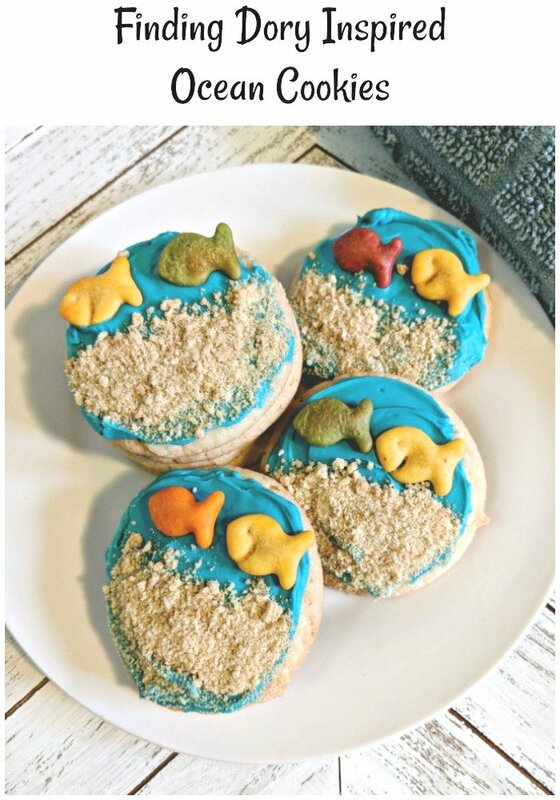 These cookies are inspired by baby Dory who likes sand! 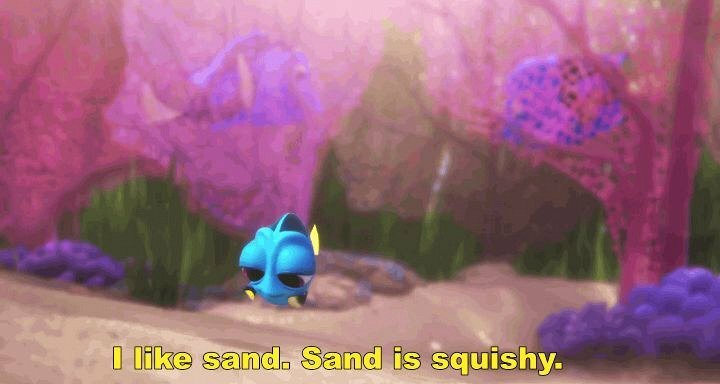 Sand is squishy. We are busy, busy, busy, so for these cookies I went with refrigerated cookie dough and canned frosting. It’s all good. 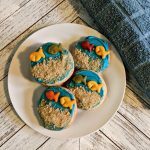 Whether you make these FINDING DORY cookies and frosting from scratch or you go the easy route, they’re cute and yummy! They’ll bring a smile to your child’s face during lunch…unless they’re a teenager, in which case, they might be mortified. Go for it. 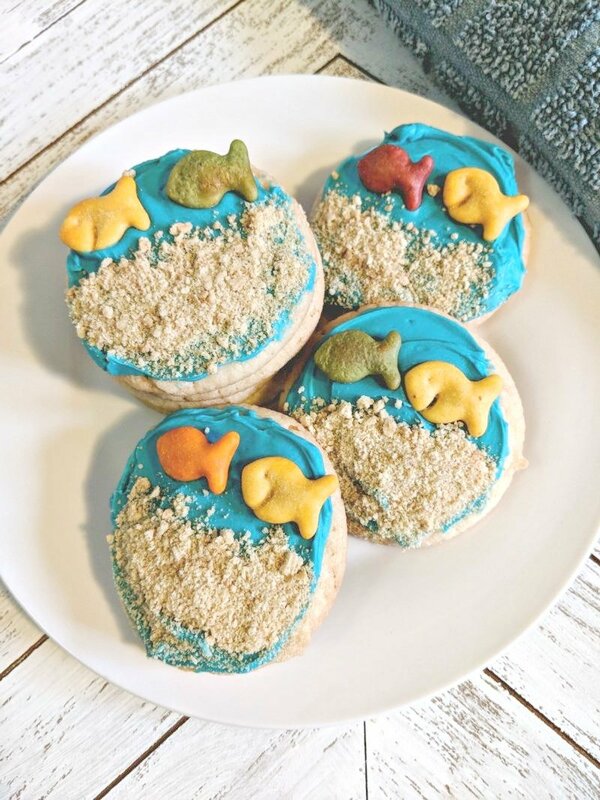 You can make these fun ocean themed cookies from scratch or use refrigerated cookie dough and do it the easy way! Much of the FINDING DORY Pixar Fest related things are also related to FINDING NEMO which I shared in an earlier Pixar Fest post. 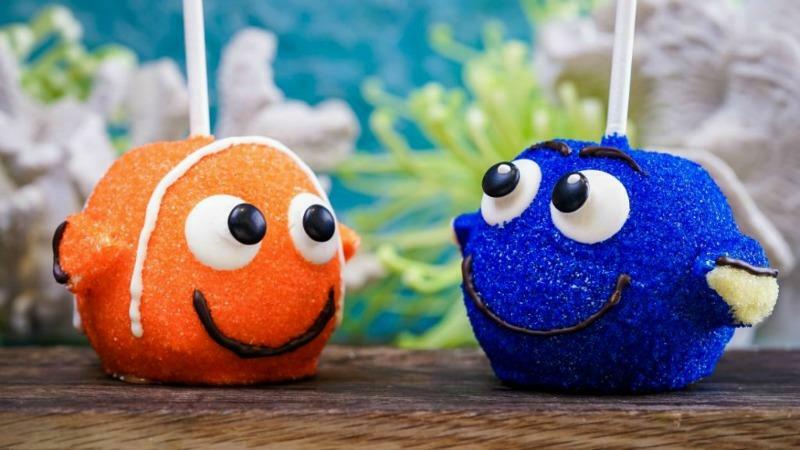 You can find Dory on one of the monorails, and there’s a cute Dory candy apple being served at locations around Disneyland Resort including: Pooh Corner in Disneyland Park and Marceline’s Confectionary in Downtown Disney.